Mohamed Hussein Tantawy Soliman (Arabic: محمد حسين طنطاوى سليمان‎, Egyptian Arabic: [mæˈħæmmæd ħeˈseːn tˤɑnˈtˤɑːwi seleˈmæːn]; born 31 October 1935) is an Egyptian field marshal and former politician. He was the commander-in-chief of the Egyptian Armed Forces and, as Chairman of the Supreme Council of the Armed Forces, was the de facto head of state from the ousting of Hosni Mubarak on 11 February 2011 to the inauguration of Mohamed Morsi as President of Egypt on 30 June 2012. Tantawy served in the government as Minister of Defense and Military Production from 1991 until Morsi ordered Tantawy to retire on 12 August 2012. Tantawy, who is of Nubian origin, joined the Egyptian Military Academy in 1952 and received his commission as an Army officer on 1 April 1955 in the infantry. Later that year he took part in the Suez War (or the Tripartite Aggression as it is often known in Egypt) as an infantry platoon commander. He was promoted to Major in 1961 and commanded an infantry company in Yemen during the North Yemen Civil War. Later in his career he was involved in the Six-Day War of 1967 as a Lt.Colonel and Battalion commander, the War of Attrition of 1967–1970, and the October or Yom Kippur War of 1973. During the Yom Kippur War he was a Lieutenant Colonel commanding of 16th mechanized infantry battalion. He held various command and staff appointments including both the Chief of Staff and then Commander of the Second Field Army between 1986 and 1989. Additionally he has served as a military attaché to Pakistan between 1983 and 1985, an important role given the two countries' political and military links. 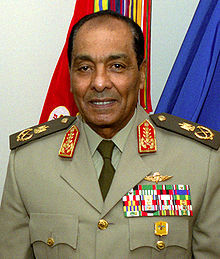 Tantawy served as a Commander of the Republican Guard Forces between 1989 and 1991, and later a Chief of the Operations Authority of the Armed Forces. In 1991, he also commanded an Egyptian Army unit in the U.S.-led Gulf War against Iraq to force Iraq to withdraw from Kuwait, which it had invaded in 1990. Field Marshal Tantawy with U.S. Defense Secretary Donald Rumsfeld, 7 March 2006. On 29 May 1991, following the dismissal of Colonel General. Youssef Sabri Abu Taleb, Tantawi was promoted to lieutenant general rank and appointed as minister of defense and military production and commander-in-chief of the Egyptian Armed Forces. After one month, he was promoted to general colonel rank which he had held for 2 years before he was promoted to the rank of field marshal, the highest rank in the Egyptian military, in 1993. It is believed that Tantawy would have succeeded Mubarak as president of Egypt, had the assassination attempt in June 1995 been successful. Early in 2011, Tantawy was seen as a possible contender for the Egyptian presidency. Robert Springborg wrote that 'Foreign military professionals.. liken[ed] Tantawi to the CEO of the largest corporate conglomerate in Egypt' because his primary concern was the economic well-being of the military, not the performance of its nominal tasks and duties. On 11 February 2011, when President Hosni Mubarak resigned, after 18 days of protests from the Egyptian people, Tantawy transferred authority to the Supreme Council of the Armed Forces, headed by himself. The council, overseeing issues with the Chairman of the Supreme Constitutional Court, Farouk Sultan, dissolved the Egyptian parliament, oversaw the referendum over temporary constitutional amendments which took place on 19 March, and presided over summons to justice, for accountability, of Mubarak and many of the former regime's top figures. On a personal level, Tantawy kept a relatively low profile since the handing over of power to the Council, only making a first public appearance in an address to mark the graduation of a batch at the Police Academy on 16 May 2011. He opted to leave most public speeches and press releases to other senior members in the council, he also appointed Prime Minister Essam Sharaf and his cabinet. Tantawy also received a number of foreign officials, including British Prime Minister David Cameron and U.S. Secretary of State Hillary Clinton. Field Marshal Tantawy with U.S. Army General Martin Dempsey, Chairman of the Joint Chiefs of Staff, on 11 February 2012. After a new series of protests in November 2011, that escalated by 22 November to over 33 dead and over 2,000 injured in the wake of the use of force by the police to quell protests at Tahrir Square and its vicinity, Tantawy appeared on Egyptian national television to pledge the speeding up of presidential elections – the principal demand of protesters – and that the armed forces "are fully prepared to immediately hand over power and to return to their original duty in protecting the homeland if that's what the people want, through a popular referendum if necessary." On 12 August 2012, Egypt's president Mohamed Morsi ordered Tantawy to retire as head of the armed forces and defence minister. Tantawy has been decorated with the Order of the Nile and appointed, instead, as an advisor to Morsi; there was speculation that his removal is part of a pre-arranged withdrawal by the military from political power in exchange for immunity from prosecution for earlier actions. Criticism of Tantawy in Egypt has been manyfold, including many chants in Tahrir for him to leave. Chants against Tantawy have included "Tantawi stripped your women naked, come join us." According to The Telegraph, protesters have also "demanded the execution of Tantawi." Nabeel Rajab, the head of Bahrain Centre for Human Rights, criticized Tantawy for his reception for King of Bahrain Hamad bin Isa Al Khalifa in October 2011. "This is a very bad message from the Supreme Council of the Armed Forces to the international community, the Egyptian and Bahraini people", he said. "Continuing this path threatens Egypt's democratic future", he added. Wikimedia Commons has media related to Mohamed Hussein Tantawi. ^ "The Cabinet". Website of the President of Egypt. 2005. Archived from the original on 11 October 2007. Retrieved 12 October 2007. ^ Sobelman, Daniel (2001). "Gamal Mubarak, President of Egypt?". Middle East Quarterly. 8 (2): 31–40. ^ Springborg, Robert. "Learning from failure: Egypt." In The Routledge handbook of civil-military relations, Routledge, 2013, p. 95. ^ "Egypt leader Mursi orders army chief Tantawi to resign". BBC News. 12 August 2012. ^ Hussein, Abdel-Rahman (13 August 2012). "Egypt defence chief Tantawi ousted in surprise shakeup". The Guardian. London. Retrieved 13 August 2012. ^ a b "Egypt: 10,000 march in protest at woman dragged half-naked through street". The Daily Telegraph. London. 21 December 2011. ^ Ahmed Al Samany (2 November 2011). "حقوقي بحريني: "استقبال "العسكري" للملك رسال سيئة.. والجزيرة تجاهلت أحداث البحرين"". Tahrir newspaper. Archived from the original on 5 September 2015. Retrieved 27 December 2011. Kechichian, Joseph; Nazimek, Jeanne (1997). "Challenges to the Military in Egypt". Middle East Policy. 5 (3): 125–139. doi:10.1111/j.1475-4967.1997.tb00286.x. Neriah, Jacques. "The Egyptian Supreme Council of the Armed Forces Under Field Marshal Tantawi: A Recipe for Revolution or More of the Same?". Jerusalem Center for Public Affairs. Retrieved 13 March 2011. This page was last edited on 2 April 2019, at 06:12 (UTC).